If you received this language in an advertisement, what would you think the book was about? To me? That write-up describes a very sad and painful personal journey through social pressures to conform to a specific "acceptable" body image, no matter what the personal cost to the actual body being laboriously and harmfully shoved like a square peg into a round hole. I would expect a book like this to be something similar to Marya Hornbacher's "Wasted", which is an excellent (if truly painful) journey through Marya's struggles with disordered eating and body hatred. I would also expect the above book to talk about the psychology of these issues, even if just in passing and/or at a lay-person's level, and how deeply unhealthy and harmful the social pressures which contribute to (if not outright cause) distorted body images can be. On ''Morning Joe,'' co-host Mika Brzezinski is often so adamant about improving America's eating habits that some people have dubbed her ''the food Nazi.'' 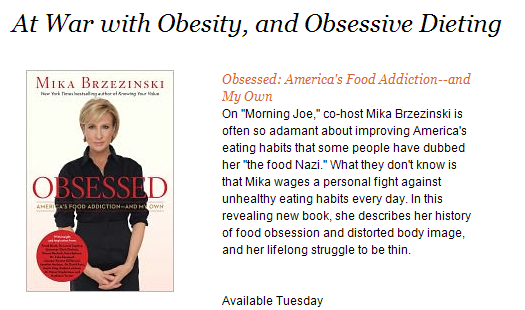 What they don't know is that Mika wages a personal fight against unhealthy eating habits every day. In this revealing new book, she describes her history of food obsession and distorted body image, and her lifelong struggle to be thin. So the publisher is using language ripped from the fat acceptance movement ("food obsession", "distorted body image", etc.) in order to promote a book which -- if you believe the headliner -- is really about "obesity" and how to be at war with it: two concepts which are completely at odds with the entire purpose of the fat acceptance movement. I'm absolutely willing to believe that Mika Brzezinski has had to deal with disordered eating and distorted body image -- I'm willing also to grant her full good faith intentions in writing her book. (Although, as full disclosure, I know almost nothing about her, and this choice to grant the assumption of good faith intentions on her part while writing this post is not meant to stifle valid criticism of her in the comments.) But I also believe that it is entirely possible to swap one form of disordered eating and distorted body image for another kind of both -- to go from a "bad" unhealthy practice to a "good" unhealthy practice where both practices are unhealthy, but one is socially condoned. And while it is entirely her right to do so -- as it is for everyone else -- it is not okay to try to impose that socially-accepted unhealthy practice on everyone else. Nor do I think it is particularly constructive to add to the harmful social messages which contribute to disordered eating and distorted body images. And especially I do not think it is appropriate to do these things under the deliberately stolen words of the major opposing social justice movement which seeks to challenge and expose those harmful social messages and the associated huge diet industry (with which the publishing industry is complicit) that broadcasts them. "I have to watch and think about every piece of food that I put into my mouth" is not actually a normal, healthy relationship with food -- and yet, this is what Savage would have all of us fatties do. Watch every bite. Think about every bite. Obsess about food. Obsess about how much we hate fat and don't ever want to go back there. Because... why again? Oh, right. Because that's way better than eating well, exercising, not obsessing, and remaining fat. Because, you know, IT'S FAT. COME ON, PEOPLE! Obsession. The word is in the book's title and in the book's marketing sting. And, I suspect, in the book's message as well: I believe we're being asked to trade one obsession for a more socially-acceptable but no less harmful one. And I'm tired of it.